An expense is a type of expenditureExpenditureAn expenditure represents a payment (either cash or credit) to purchase goods or services. An expenditure is recorded in a single point in time (the time of purchase), compared to an expense which is allocated or accrued over a period of time. This guide will review the different types of expenditures in accounting that flows through the income statementIncome StatementThe Income Statement (or Statement of Profit and Loss) shows performance from operations of a business. The financial statement begins with revenues and and is deducted from revenue to arrive at net incomeNet IncomeNet Income is a key line item, not only in the income statement, but in all three core financial statements. While it is arrived at through the income statement, the net profit is also used in both the balance sheet and the cash flow statement.. Due to the accrual principleAccrual PrincipleThe accrual principle is an accounting concept that requires transactions to be recorded in the time period during which they occur, regardless of the time period when the actual cash flows from the transaction are received. The idea behind the accrual principle is that financial events involve matching revenues in accounting, expenses are recognized when they are incurred, not when they are paid for. As the diagram above illustrates, there are several types of expenses. The most common way to categorize them is into operating vs. non-operating and fixed vs. variableFixed and Variable CostsFixed and variable costs are important in management accounting and financial analysis. Fixed costs do not change with increases/decreases in units of production volume, while variable costs are solely dependent on the volume of units of production. This guide teaches an analyst the fixed vs variable cost methods. 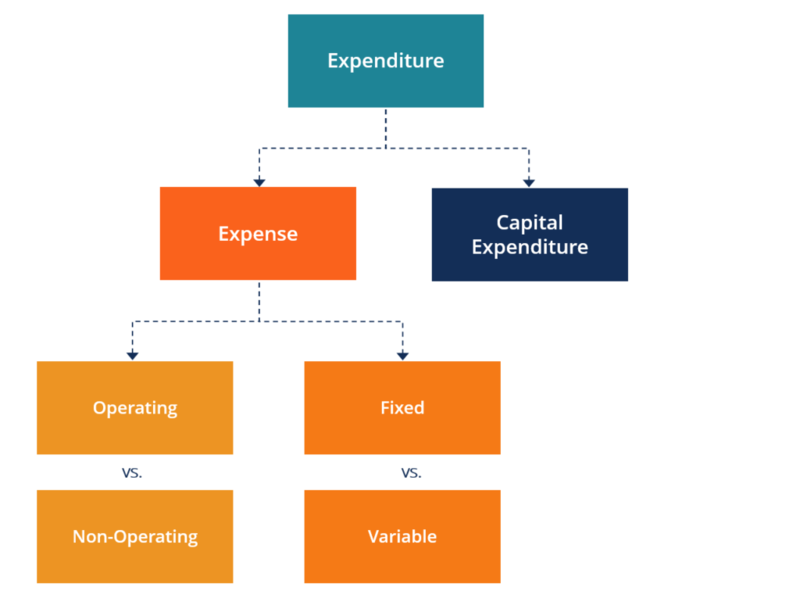 The only difference between an expense and a capital expenditureCapital ExpenditureA Capital Expenditure (Capex for short) is the payment with either cash or credit to purchase goods or services that are capitalized on the balance sheet. Put another way, it is an expenditure that is capitalized (i.e. not expensed directly on the income statement) and is considered an "investment". Analysts view Capex is that an expense has been recognized under the accrual principle and is reflected on the income statement, whereas a capital expenditure goes straight to the balance sheetBalance SheetThe balance sheet is one of the three fundamental financial statements. These statements are key to both financial modeling and accounting. The balance sheet displays the company’s total assets, and how these assets are financed, through either debt or equity. Assets = Liabilities + Equity as an asset. Once a capital expenditure goes on the balance sheet as an asset, it can be expensed later as depreciation and amortization, which flows through the income statement. The statement of cash flowsStatement of Cash FlowsThe Statement of Cash Flows is one of the 3 key financial statements that reports the cash generated and spent during a specific time period, it acts as a bridge between the income statement and balance sheet is where the actual timing of cash payments for all expenditures will be reflected. To learn more, check out CFI’s free tutorial on how to link the thee financial statements in ExcelCFI Webinar - Link the 3 Financial StatementsThis CFI quarterly webinar provides a live demonstration of how to link the 3 financial statements in Excel step by step. Follow the instructor in Excel and download the completed template from the webinar. Learn the formulas and proper linking procedure to connect the income statement, cash flow, and balance sheet. 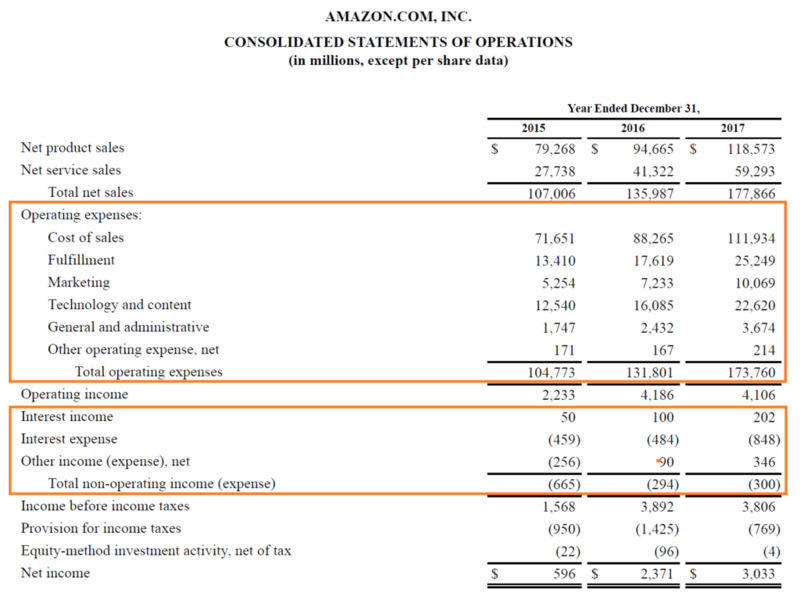 Below is an example of Amazon’s 2017 income statement (statement of operation) which lists their main categories of expense. As you can see, Amazon separates its costs into two categories. Operating expenses consist of cost of sales, fulfillment, marketing, technology and content, general and administrative, and other. Non-operating expenses comprise interest expense (and income), and other expense (income). Finally, Amazon has charged a provision for income taxes and accounted for equity method investment activity. To learn more, check out CFI’s Free Accounting Courses. Most, but not all, expenses are deductible from a company’s income (revenues) to arrive at its taxable income. The most common tax-deductible expenses include depreciation and amortization, rent, salaries, benefits and wages, marketing, advertising, and promotion. Items that are not tax deductible vary by region and country. It’s important to consult a professional tax advisor to learn about what expenses are deductible and not deductible in your or your company’s situation.